I attended Aero India 2013 airshow on 10th Feb at Air Force Station Yelahanka, Bangalore. This was the first airshow i attended with a 'proper' camera i.e. a DSLR :). This was also the first airshow i attended in which a significant part of the air display comprised modern fast jets. This post is about my experience photographing (and some video shooting) the airshow and lessons that i learned. My rig consisted of a Nikon D7000 APS-C DSLR with a Nikkor 18-300mm lens. Images were stored on a Sandisk Extreme 64 GB 45MB/s SD card along with a 16 GB backup card. I also carried an EN-EL15 spare battery. I didn't need to use the spare battery even though i was shooting from 10.30 am to 4.30 pm. It was very dusty and there was a light easterly breeze so changing lenses out in the open would be quite difficult. The available options would be to use a sufficiently wide range zoom lens or carry multiple bodies with lenses of different focal lengths attached (like below). I had been using the D7000 and 18-300mm lens for the 4 months prior to the airshow so had a fairly good idea of the settings to use for photographing flying aircraft. I had two main settings which i programmed into User Settings U1 and U2 on my camera. I used U1 for photographing jets and U2 for propeller aircraft and helicopters. The reason i used Manual mode has to do with the lens i used. As per my tests and the literature (dpreview.com , Thom Hogan), at 300mm, the Nikkor 18-300mm is sharpest between f/8 and f/11 (both limits inclusive). At the same time i wanted to use a shutter speed of 1/1000s (or more) for photographing flying aircraft and birds. I found that a combination of 1/1000s and f/8 doesn't overexpose even in very bright conditions. For helicopters and prop aircraft it's advisable to use a relatively slow shutter speed (1/60 - 1/100s) to capture the full rotor/prop disc. This requires flawless panning technique (which i haven't yet developed). A problem with such slow shutter speeds is that a very narrow aperture will be required (to prevent overexposure in sunny conditions) which might cause the image to soften due to diffraction. A peculiar problem with the particular lens i used, which has also been mentioned in dpreview.com, is that its image stabilization (VR) is least effective at 1/80s and which starts to become ok again at about 1/160s. Hence, i settled for 1/160s and f/11 (for U2) for shooting helicopters and props. This setting may cause up to a stop of overexposure (using matrix metering) in bright conditions but as i shoot in Raw, i haven't found this to be a problem. 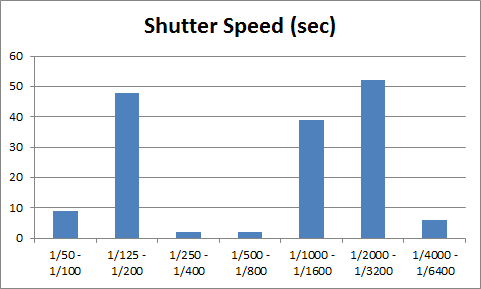 If i go slower than 1/160s, the percentage of keepers is very low due to motion blur caused by poor panning technique and/or the VR problem mentioned above. I used 'CH', high burst mode (which is 6 FPS for the D7000) and clicked most shots in bursts of 2 to 3 images each. I used Continuous Autofocus along with a single focus point at the centre of the frame. I expected that 300mm wouldn't be long enough but i was pleasantly surprised to find that it was more than enough for most cases (except for shooting small prop aircraft at top of loop). All the aircraft filled the frame, and more, when they flew along the runway, which was 250 metres in front of the viewing paddock. Images of aircraft shot more than 800 metres away didn't come out well due to distortion due to heat haze, so having a longer lens might not improve matters in this case. As per data i gleaned from Lightroom, with respect to my keeper images, 79% of them were shot at 300mm, 6% at 18mm (for the panoramic and crowd shots) and the remaining 15% between 18mm and 300mm (mostly for the head-on passes, static display and for fitting huge aircraft like the C-17 within the frame). Still images are fine for capturing detail and for capturing a particular point in time but nothing beats a video for capturing the ambience of an event and for showing motion. Especially when the event is an airshow, a still image just can't reproduce, say, the sound and extreme speed of a fast jets in a head-on pass. This was the first time i used a DSLR for video at an event. Previously, i had used an SLT camera (Sony SLT-A65), bridge cameras and compacts for video. 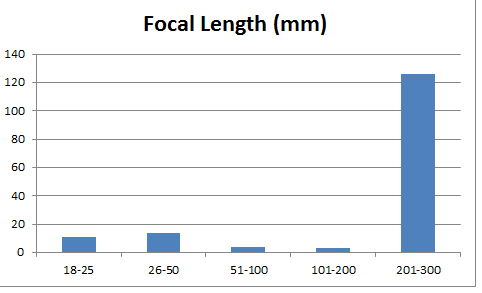 For bridge and compact cameras with their large depth of field, autofocus wasn't much of an issue. The SLT-A65 had exceptional video autofocus as it used phase-detect autofocus even for video. Unfortunately, in DSLRs (or at least the ones that i have used), autofocus in video is a joke - it's noisy, hunts most of the time and many a times refuses to focus at all. Autofocusing a fast moving aircraft is impossible. Which is why i decided to use manual focus during video. I had used manual focus during video prior to this airshow, while shooting airliners and general aviation aircraft. I set the aperture to f/22 to get a relatively large depth of field (i got the idea from imaging-resource.com) then i set the focus distance to the hyperfocal distance, 200 metres (at 300mm focal length). This gave me a depth of field from 100 metres to infinity. This is ok for an airshow as most of the air displays are at a distance of at least 200 - 300 metres from the viewing area. So, once i set the focus distance, there was no need to fiddle with it during the action. A few words about zoom. Once i had set the focal length (usually 300mm), i used it through out the shot as it's difficult to smoothly zoom in and out while panning a handheld DSLR. The only exception was when i zoomed out from a Flying Bulls Zlin Z-50 to capture a 'bomb burst' manoeuvre. The resulting clip was very shaky but i had no other choice at that time. I shot at 1080p, 24 FPS (highest resolution on the D7000). I used Aperture Priority mode with the aperture set to f/22. In the D7000, once the aperture is set, it can't be changed for the duration of the video clip. 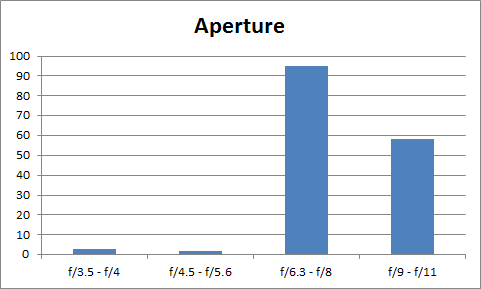 Also, in Aperture Priority mode, ISO is always Auto ISO (varies from 100 to 6400). I also set the minimum shutter speed to 1/50s. 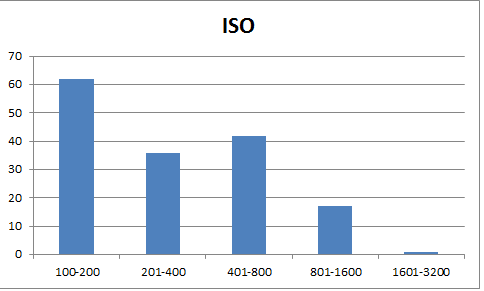 This causes the camera to slow down to 1/50s before it shifts to the next higher ISO (when light level decreases). If light level becomes very low and ISO has topped out at 6400 then the D7000 will disregard this speed limit and slow down to 1/30s. A happy side-effect of the narrow aperture (f/22) is that shutter speeds are usually in the range 1/50s - 1/100s most of the time, which is very useful in capturing rotor/prop blur discs. I shot the video clips holding the camera at arms length, looking at the LCD. This is not the right way to do it. I could barely see the LCD in the bright sun and it was very difficult to track something like a grey jet fighter against a greyish blue sky. This, along with poor panning technique, caused almost all my video clips to come out extremely jerky (enough to cause the viewer motion sickness :). The jerkiness was alleviated quite a bit by using the 'Stabilize' function of Sony Movie Studio video editor but this cure had its own problems like shimmering/wobbly artifacts in places. Here are some of the lessons i learned at the airshow. I could correct some mistakes or change my style as the day progressed but some other lessons i learnt only during post processing. Many of the points are subjective based on what looks/feels good to me. With correct panning technique, 1/1000s seems to be fast enough for shooting fast jets, though 1/2000s might be required for some manoeuvres (with attendant increase in ISO and, hence, noise). 1/4000s or more is required for capturing sharp images of aircraft approaching each other in a head-on pass. Pan along with one of the aircraft and press the shutter as soon as the opposing aircraft is seen in the frame. If lower shutter speeds are used then the panned aircraft will be sharp but the opposing one will be blurred. Viewer's eye (mine at least) naturally falls on the nose/cockpit of the aircraft so try to keep this part sharply focused. For jumbo aircraft, if direction of pass is known beforehand then move the focus point to the opposite side of the frame i.e. in direction of pan. When the aircraft enters the frame, keep the focus point on its nose. If focus point is left at the centre then the nose of the aircraft might be out of focus or if the aircraft nose is placed at centre of frame then rest of the aircraft might fall outside the frame. The above point regarding moving focus point in direction of pan might also be a good idea in photographing aircraft with smoke on as more of the smoke trail will be in frame. I didn't get too many keepers shooting the Flying Bulls at 1/160s. Along with improving panning technique, it might be a better idea for me to shoot small aerobatic aircraft at 1/250s or maybe even 1/320s. If aircraft is behind jet exhaust (maybe even its own) then image might be distorted due to heat waves. Remember to open up the aperture at shorter focal lengths. There's no need to stick to f/8 - f/11 (for the Nikkor 18-300mm). Take photos of each aircraft type from all angles - both sides, head-on, top plane, bottom, isometric. Take at least one photo of all aircraft together in an aerobatic team. For static displays, use narrowest possible aperture (before diffraction) to get maximum possible depth of field. Underside of aircraft is not interesting (to me at least :) unless gear is down. If an aircraft or aircraft formation is too large to fit inside the frame at full zoom (300mm in my case) then don't take their photo at a distance in order to make them fit inside the frame. Doing so might increase distortion due to heat haze. Instead, let the large aircraft/formation come close then zoom out (use shorter focal length) till they fit inside the frame, then take the shot. For head-on passes, don't zoom out too much - 2 - 4 aircraft lengths might be enough. While selecting photos for post processing, sort in reverse order as one gets better shots as the day progresses as technique improves. There's no need to waste time wading through start of day shots which are usually of poorer quality. Most of the points in this section are very subjective, based very much on what feels right to me. Start shooting when aircraft is approaching and stop when it is receding, not when it is abeam. Try to follow and shoot each manoeuvre to completion. In formation aerobatics, follow the lead aircraft (or single out some other one) and keep it near the edge of the frame (so that as many of the other aircraft as possible are also inside the frame). Don't waver between aircraft during the duration of the shot. Capture all the different manoeuvres for each aircraft type. Don't mix up subjects in a single video clip. Clean the sensor before the show. Dust spots on the sensor will show up as distracting blobs in video due to the narrow apertures (f/22 in my case) used. Use an LCD Viewfinder while shooting video. This will make a more stable platform by adding a point of contact between camera and shooter and it also makes seeing the image in the LCD much easier in bright sunlight (I went and got an LCD Viewfinder on Ebay after the airshow and i must say the video shooting experience is now orders of magnitude better). I shot a total of 1,476 photos and videos of which 1,423 (96%) were photos. All the 53 video clips amounted to 32 minutes, 4.99 GB (1080p24 @ 20 Mbps) of footage. After sorting out the photos/videos, i post processed 184 photos (13%) and 46 video clips (86%). The rest were discarded due to duplication, motion blur, missed focus,poor composition and image noise. After post processing, i finally selected (after again discarding duplicates) 156 images (11% of the total images shot). Excellent blog entry. The numbers you run through are great. Have you tried auto area mode? So long as you have a good clean shot of the plane (nothing in the foreground) I find it does much better on my D90 with 70-300VR as at least one of the focus points will lock and often multiple. It does choose closest focus so I don't have to worry about it focusing on the tail (most times - it's not perfect). I keep it above 1/400th myself for airshows unless the light is bad. Remember VR/stabilisation does NOTHING for subject motion. Prop blur is over-rated - it works best on air to air or static with engine running. While panning technique can improve (with lots of practice, which you may not get the chance to have) there are human limitations you're not going to do better than. If I get the chance I'm going to have to try 1/4000th on opposing aircraft some time. I'm not as interested in video but I'll have to try it too. Record number of shots at an airshow is 6300 (but no video). Thanks for the comment and tips Sammy. I hadn't used auto area mode enough prior to the airshow to be confident about using it during the event. Anyway, i'll give it a try on the local airliners and GA aircraft. Thanks for the useful info. The comment about the auto area mode is bang on. I have just moved on to Nikon after having been a Canon fan for as long as I can remember, although Pentax and Panasonic have also played bit roles. I have just purchased a D7000 with a 55-300VR lens and it has yet to prove itself at serious airplane stuff. If interested you may find some of my stuff at http://www.flickr.com/photos/dirani60/. I have just started there. C&C are most welcome. By the way, other than airshows, how is the security re. photography at airports??? I visit Pune quite often ( Once a year minimum) and would love to capture those SU30's. I know a spot at the approach end of the runway, where I can get both, civil and defense craft, at an altitude of 50-100 feet TO or landing. Thanks for your comment Donesh. The D7000 is an excellent camera and i'm sure you will enjoy using it.